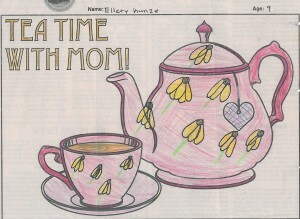 The Sun is proud to announce its winners for the Mother’s Day Coloring Contest. Published in all 10 of our newspapers, children from around South Jersey and Princeton colored a tea pot and tea cup and sent their creation to us. Winners of the contest received a four-pack of tickets to Sahara Sams! The winners for the Moorestown Sun are Teaghan Reilly, 3, Wilhelmina McGee, 6, Coralyn, 7, Ellery Kunze, 9, Peter Simpson, 8, and Joseph J. Katt, 14. To see the winners’ entries, please visit our Facebook page, www.facebook.com/moorestownsun.